Bridges have always had symbolic meaning. When discussions were taking place on the design of the first Euro notes, it was decided that the common illustration on all denominations should be a bridge - to symbolise the joining together of people, communities, and nations. Our Sepia Saturday theme image this week is entitled "Rough Wooden Bridge Over River, Group With Dog on the Shore". It comes, via Flickr Commons, from the Phillips Glass Plate Negative Collection, at the Powerhouse Museum, Sydney, Australia. 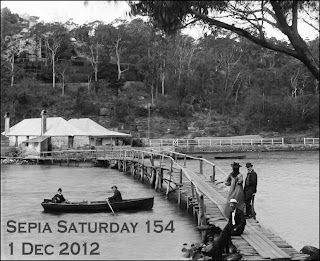 The Museum provides no further information about where the bridge is, but the brilliance of on-line communities such as Flickr Commons (or, indeed, Sepia Saturday) is that such information is soon forthcoming : the footbridge was in Mosman Bay on the north shore of Sydney Harbour. The location of the photograph is not the only question posed by the title - it takes a sharp eye to spot the reported dog. You Sepia Saturday theme for this week could therefore be bridges, lakes, rowing boats, dogs (present or absent), or whatever you care to make it. Just post your post on or around Saturday 1st December 2012 and add a link to the list below. Overalls and kisses are for the future, however. 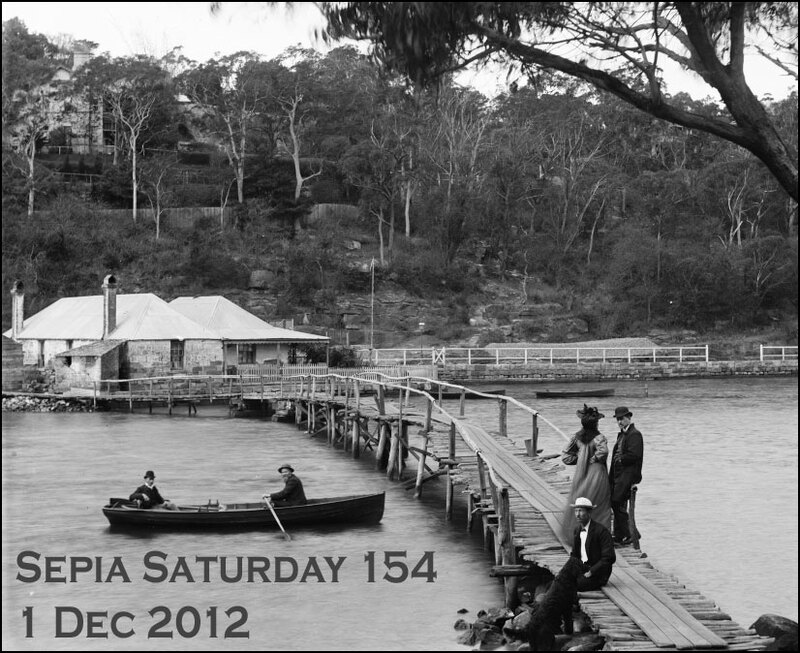 For the moment, step onto the bridge to the past that is Sepia Saturday and post your images for Sepia Saturday 154. Old photographs are wonderful aren't they? I know I am preaching to the converted, but isn't it wonderful how an old photograph can send you on a journey : a fascinating journey of discovery. Take our archive image this week which comes from the Samuel Bell Maxey Collection at the Texas State Archives and is available via the wonderful Flickr Commons service. The only information provided is that it is a photograph of Lala Williams and Elgie Crook, but with just a few Google clicks you can discover that ...... Well, I don't want to spoil the journey for you, so go and click your own Google and take your own journey of discovery. And so this is our theme image this week - post your posts on or around Saturday 24 November and link them to the list blow - and there are one hundred and one theme strands you may care to follow. All you need to do is to look into those two faces and let your imagination run free. 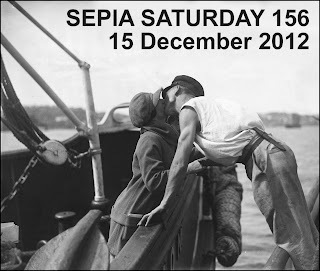 So that your imagination can shop early for Christmas, here are the next two Sepia Saturday archive image prompts. But for the moment look again at the photograph of Lala and Elgie and let it work its sepia magic. 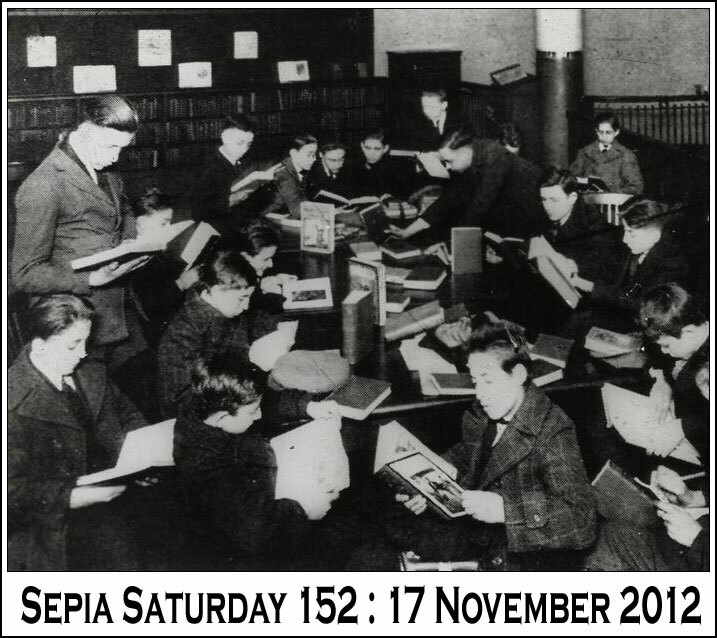 Our Sepia Saturday Archive Picture Prompt this week comes from the collection of the New York Public Library and features a group of children avidly reading their books following a talk about books by the staff of the Library. 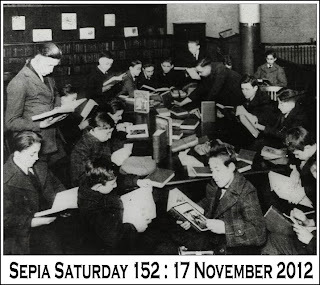 The picture dates back to the 1920s (note : there is not a Kindle in sight) and offers a variety of potential directions for Sepia Posters to take (books, reading, kids, libraries, ridiculous check jackets ... or whatever). The only instruction, as usual, is to post your post on or around Saturday 17th November 2012 and include a link on the list below. 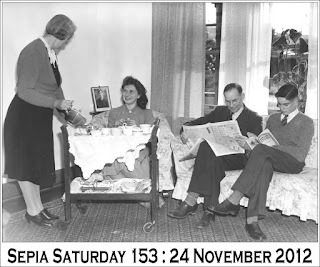 Now I know we had a reading prompt fairy recently and you may think that the Sepia Saturday archivist has once again lost the plot (especially as there was a strikingly similar image previewed for SS153). And you would be right. However, I have swallowed a couple of those little yellow pills and things seem much clearer now. Therefore I have decided to withdraw the prompt image for SS153, replace it with a new one, and forget the whole episode ever happened (I suspect I need a holiday). 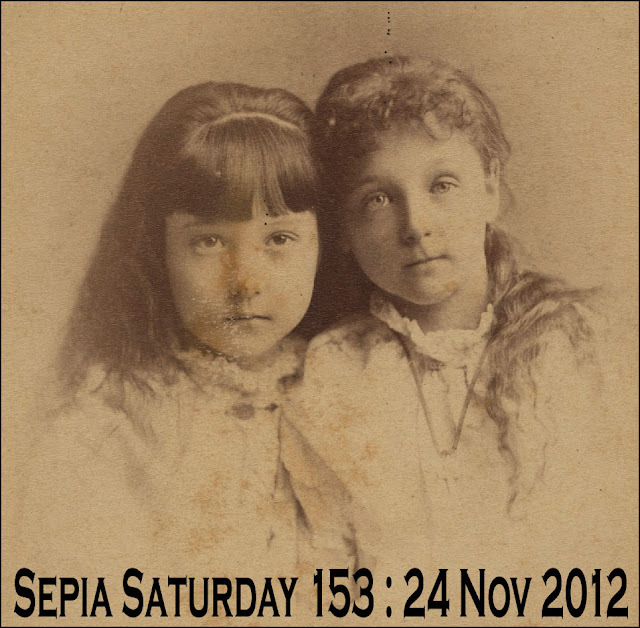 So here is a preview of the next two Sepia Saturday prompts for those who like some advanced notice of the confusion to come. You can, as usual, read into those two images exactly what you want to, but don't start reading until you have completed your submission to Sepia Saturday 152. Now, are you sitting comfortably? So here I am, back home again, safe and sound on dry land. Let me first of all thank my good friend Kat Mortensen for looking after Sepia Saturday in my absence. From the look of things, Sepia Saturday has been in very good hands indeed. I still haven't unpacked the cases yet, so I will get straight on with this weeks' call, and for Sepia Saturday 151 the subject of our call is .... calls. Or telephone calls, or exchanges or whatever you would like to interpret the above photograph from the US National Archives which is entitled "Photograph of Women Working at a Bell System Telephone Switchboard". 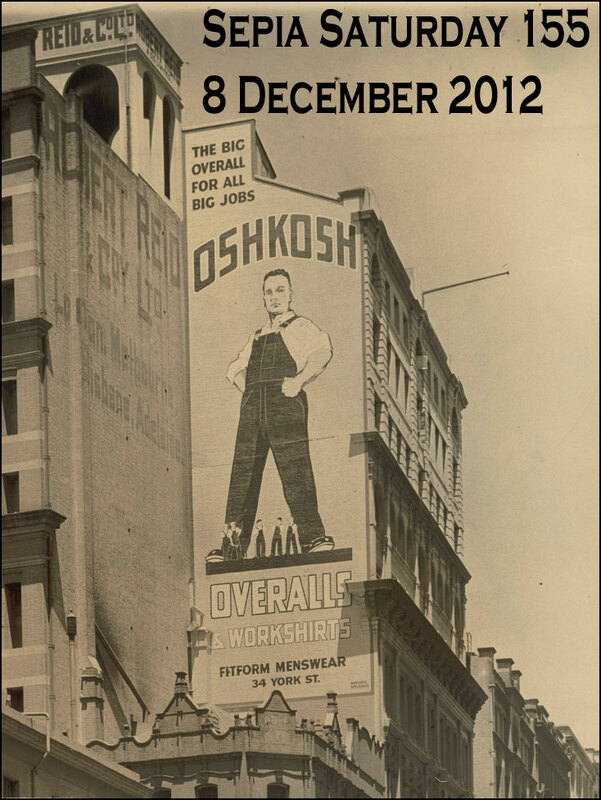 As usual, all you have to do is to post your own old image and add a few new reflections on or around Saturday the 10th November 2012. 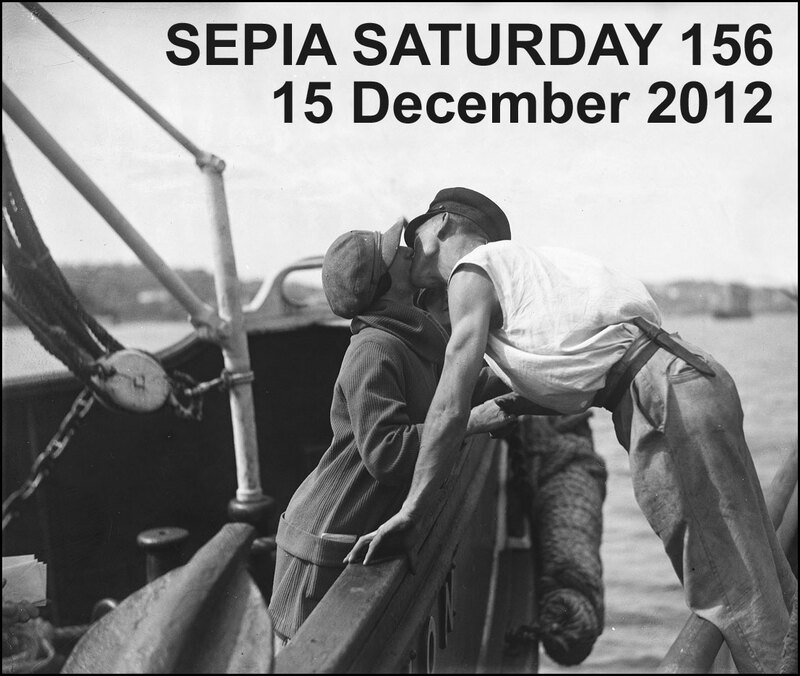 Once you have posted, add a link to the list below and then try and drop in on as many other Sepia Saturday callers as you can. 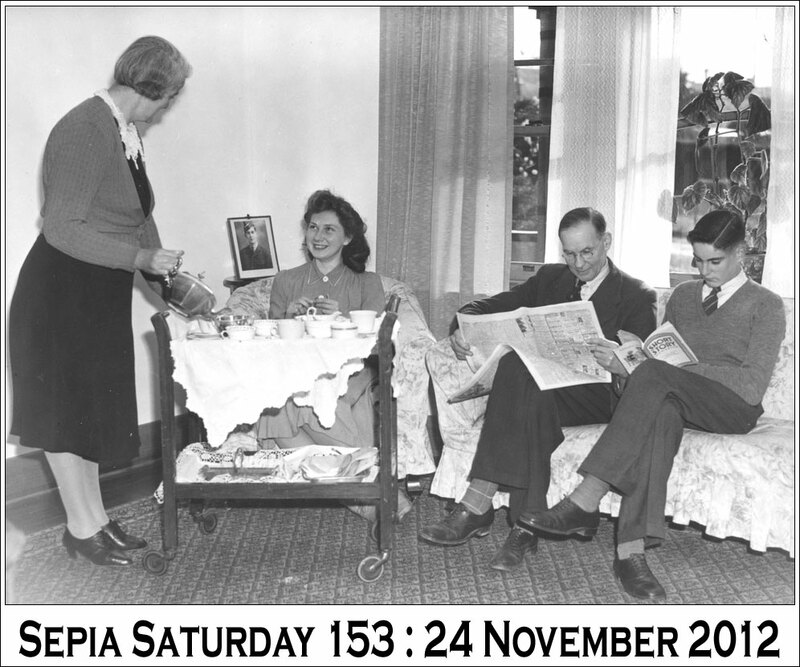 For those who like to think about future calls in advance, here is a quick preview of the next two Sepia Saturday archive photographs. But this week it is the telephone exchange. 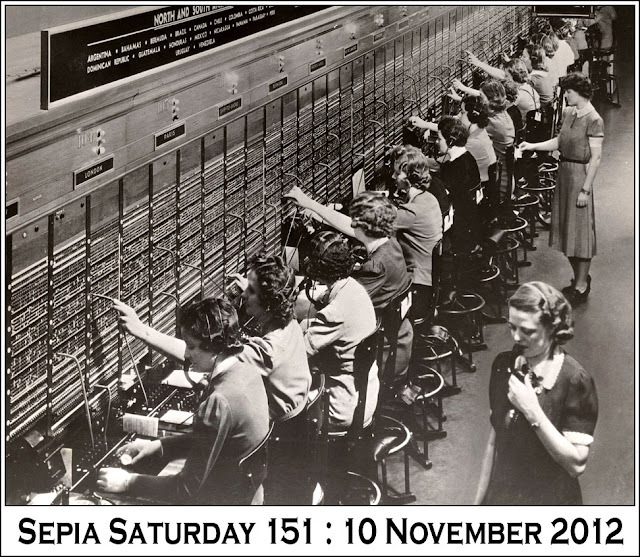 I suppose, when you think about it, Sepia Saturday is a kind of graphical telephone exchange. So dial up, plug in and give us a call.